Advice from industry experts for how to run your business, based on the real-world experience of your peers. Sarah Lawson (center) S+H Construction's former project manager and now new owner with company founders Alex Slive (left) and Doug Hanna. Two high school buddies and business partners share how they found a successor and an exit strategy for their home building/remodeling company. This 6,400-square-foot Hammerwell home in Boulder, Colo., was designed by Boulder firm HMH Architecture + Interiors and features a solar thermal system capable of producing 150,000 Btu per hour, providing heat for the home as well as hot water for the current spa and a future pool (Photo: David Lauer Photography). Buyer co-ops are trying to do more than just find rebates for home builders. The Krause Music store, a national landmark and one of the last buildings designed by Chicago architect Louis Sullivan in 1922, was renovated by Goldberg General Contracting (Photo: Hedrich Blessing Photographers). Side jobs that started as busy work during slow times or a new niche with growth potential can broaden a custom home builder's portfolio. The Highenders, one of 31 groups in the NAHB’s Builder 20 program, gathered in Washington, D.C., for an October networking meeting with builders from five other Builder 20 clubs and presented their best practices and processes for managing contract to warranty issues. Builder 20 Club members laud their network as a deep resource for best practices, wisdom, and camaraderie. 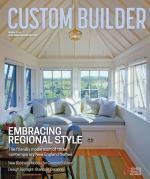 Building material suppliers say collaborative builders are their favorite clients. Building Florida homes that work with nature reduces the burden of living in them. Nineteen in-house carpenters enable Farinelli Construction to satisfy central Pennsylvania's desire for handcrafted home building.